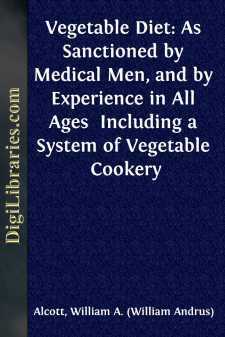 The following volume embraces the testimony, direct or indirect, of more than a hundred individuals—besides that of societies and communities—on the subject of vegetable diet. Most of this one hundred persons are, or were, persons of considerable distinction in society; and more than fifty of them were either medical men, or such as have made physiology, hygiene, anatomy, pathology, medicine, or surgery a leading or favorite study. As I have written other works besides this—especially the "Young House-Keeper"—which treat, more or less, of diet, it may possibly be objected, that I sometimes repeat the same idea. But how is it to be avoided? In writing for various classes of the community, and presenting my views in various connections and aspects, it is almost necessary to do so. Writers on theology, or education, or any other important topic, do the same—probably to a far greater extent, in many instances, than I have yet done. I repeat no idea for the sake of repeating it. Not a word is inserted but what seems to me necessary, in order that I may be intelligible. Moreover, like the preacher of truth on many other subjects, it is not so much my object to produce something new in every paragraph, as to explain, illustrate, and enforce what is already known. It may also be thought that I make too many books. But, as I do not claim to be so much an originator of new things as an instrument for diffusing the old, it will not be expected that I should be twenty years on a volume, like Bishop Butler. I had, however, been collecting my stock of materials for this and other works—published or unpublished—more than twenty-five years. Besides, it might be safely and truly said that the study and reading and writing, in the preparation of this volume, the "House I Live In," and the "Young House-Keeper," have consumed at least three of the best years of my life, at fourteen or fifteen hours a day. Several of my other works, as the "Young Mother," the "Mother's Medical Guide," and the "Young Wife," have also been the fruit of years of toil and investigation and observation, of which those who think only of the labor of merely writing them out, know nothing. Even the "Mother in her Family"—at least some parts of it—though in general a lighter work, has been the result of much care and labor. The circumstance of publishing several books at the same, or nearly the same time, has little or nothing to do with their preparation. When I commenced putting together the materials of this little treatise on diet—thirteen years ago—it was my intention simply to show the safety of a vegetable and fruit diet, both for those who are afflicted with many forms of chronic disease, and for the healthy. But I soon became convinced that I ought to go farther, and show its superiority over every other. This I have attempted to do—with what success, the reader must and will judge for himself.